What if the Moodle UX was like Netflix? Having spent the past few days in London with a colleague trying to figure out the future of “digital learning”, I couldn’t stop thinking about what an LMS (such as Moodle) would look like if it adopted a truly simplistic design and setup. A design that “encourages”, nay… damn right forces you to love it. Imagine if the image above was your dashboard. And your courses were nothing more than “covers”, like movie covers on Netflix or Amazon. And the course you last viewed was bigger than the other tiles and highlighted, and when you clicked on it, it resumed where you left off. When you click on the course, you get one single, simple page. The course may be just a single activity, whether an H5P Project, a SCORM package or a video. It doesn’t matter. “But one single activity isn’t enough, I hear you say”. Well, why not make lots of single activities? Like a library, whereby each course is in fact just a placeholder for an amazing resource. So we stop building long topic driven courses that look they are trapped in 2009 and actually build courses that offer personalisation where the user can chose what they want to learn. Like we chose what we want to watch. Users could simply “add courses” to their library (think self enrolment), they can keep the course (if they like) or un-enrol when they are done. Netflix don’t explicitly tell me what I should watch, but they certainly sway my hand. It’s all in the presentation, and tagging. Something which Moodle can do really well. 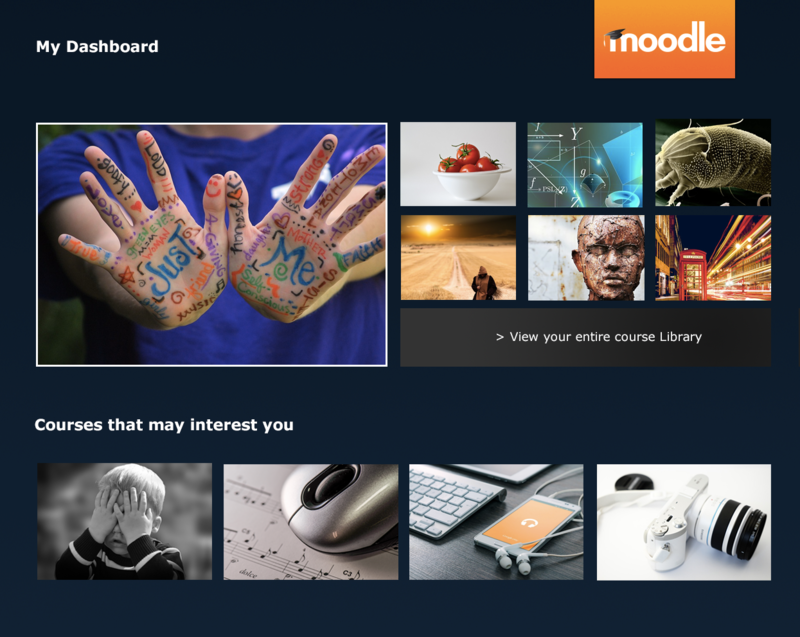 No messy course formats, no ugly Moodle hacks, no specialists blocks, just a clever Moodle Theme and a change of culture (a revolution, if you will). We could turn off all the bloat, hide all the settings and have a front-end more akin with the tech we use daily. I can hear screams of Moodle admins and teachers crying that “this wouldn’t work in our organisation“, but in the same vain, I can hear cheers from learners who don’t give a damn about the backend, the gradebook, the pedagogical workflow of the course, or how clever an API is. They want to log in and learn. That’s it! I believe this type of approach (although admittedly not suitable for all organisations) would perfectly suit the casual learner. Those who are time precious, who need to dip in and out of content..and who knows.. if done right…may “binge watch” your course resources like a box set of Game of Thrones. You never know. I haven’t built this yet, as I’ve been insanely busy, but the more I think about it, the more I can’t stop thinking about it. It could be crazy enough to work.